HOUSTON, Texas, July 6, 2011 (SEND2PRESS NEWSWIRE) — Utilizing the allure of their signature A CUT ABOVE® Super Ideal Diamond brand, the ongoing Whiteflash FRIENDS ARE LIKE DIAMONDS promotion on Facebook is connecting new friends and spreading the love of ideal diamonds. A trio of dazzling diamond jewelry pieces is being given away in the process! The first two prizes have already been claimed, with the grand prize still to be awarded. May and June were dazzling months for Amanda Welling of Lancaster, PA (May’s winner) and Michelle Kennamer of Albertville, Alabama (June’s winner). Amanda received a pair of Dreams of Africa® diamond earrings ($275 retail value) and Michelle won a Verismo Pendant Set ($1500 retail value) featuring a Whiteflash signature A CUT ABOVE® Super Ideal Diamond. The grand prize is a white gold tiffany style solitaire ring set with a spectacular .46ct A CUT ABOVE® Princess which will be awarded to a lucky winner on July 30th. There is still time to enter and win! Step 4) To increase your odds of winning answer the weekly Whiteflash Facebook pop quiz correctly and get 5 bonus entries for the final drawing. And to bring additional awareness to their industry leading Customer Loyalty Program, Whiteflash is DOUBLING the cash reward for qualifying referrals to $200 during the Facebook contest! In addition to making a number of participants very happy, Whiteflash has caught the attention of the online community for a promotion that harnesses the power of the contagious passion that their loyal customers have for A CUT ABOVE® diamonds. Fans of Whiteflash can spread the joy seamlessly in the course of their normal Facebook routines, while at the same time earning entries for fabulous prizes and cash for qualifying referrals. Anyone interested in entering the grand prize drawing can still participate. 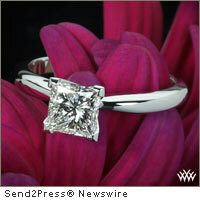 The A CUT ABOVE® Princess Super Ideal Diamond Ring ($1800 value) could be yours by simply being FRIEND-LY! *Visit www.whiteflash.com for details and contest rules, and to register for your $200 award check. Whiteflash is a full scale manufacturing jeweler specializing in Ideal Diamonds and Fine Bridal Jewelry, and stocks the biggest inventory of AGS Certified Ideal Cut Diamonds in the world. Whiteflash is the first jeweler in the world to attain ISO 9001 certification for total quality management.